Music is one serious thing that never fails to make you calm, relieved, peaceful, and feel like a ‘bliss’, whenever you are going through any kind of emotional ride. It’s the best remedy for you, no matter what. And this year too, some songs – be it in the category of pop, indie, country or dance – were just so amazing to hear that they became everyone’s favorite as far as the playlists are concerned. But the most interesting fact was that not only the big and already established music stars, but also the new, rising, young, and talented voices made their best impressions too, this year. 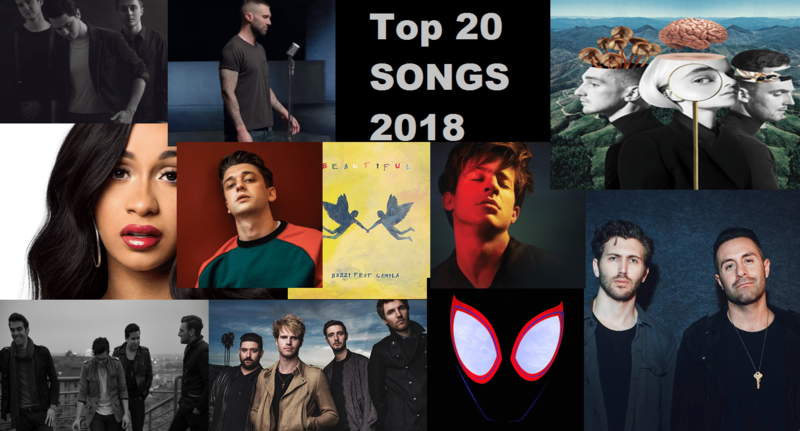 So, here are the best, hand-picked, and most deserving inevitable top 20 songs of December 2018, before you enter in 2019! Probably the most heard song of this year; absolutely hands down! Adam Levine’s magnificent voice, combined with Cardi B’s enchanting in-between words, makes up for a song which has become the best hit of 2018. This song is so good that you won’t be able to resist yourself from tapping your feets from one position to other. Eventually, you will end up dancing onto it, on loop. A song that feels sometimes more like a piece of soulful music to the ears which is just hard to miss. Marina’s voice is incredibly captivating while Luis Fonsi’s vocals just add up to the melodious saga that this song tries to make you listen and feel. Just like the movie, the music of this animated superhero flick is absolutely outstanding too. Especially this one is very motivating and inspiring while making your goosebumps rise inside. Another fine song from the same movie’s album, Sunflower is catchy in its own way which makes it the best choice to start your day in the morning. Listening to it just makes you feel lighter, fresh and happy. Here comes the most talented and rising singer of the coming year. This song just makes you feel a specific moment in a way that can’t be expressed in words. Plus the voice of Flynn is so good to the ears that you will ultimately end up listening to this one on loop. At the end of the year, Flynn again came up with his another masterpiece, My Gold, which turned out to be equally amazing and irresistible at the same time, just like his previous hit, Red Light. The singer is only going to be the best version of himself, from here. Another famous but less popular musical band whose songs are always soothing to the ears. And this song just makes you listen to it again and again and again, repeatedly. Camila Cabello turned to unmatched fame when she chose to come out with her own album as an individual singer (it was her best decision too). Havana not only became the best pop song in early 2018 but till now it’s been in the top songs of the year. Every time when you listen to this one, it only makes you dance. Another slow, yet nicely paced number from the hit debut album of Camila Cabello. Real Friends is hard to miss in any way possible when you plug the earphones in, especially in a quiet, windy place in the night, or while you are riding your car or bike. Another fantastic song of the year that has gained a stellar recognition worldwide in multiple awards too. Yet another famous and greatly crafted song from the same superhero movie’s album. The movie’s music was one of Kendrick Lamar’s best works so far. Though the song is a year old yet the energy, enthusiasm, and motivation which it generates inside you is stupendous in its own manner. This song is from the best album of the band too, of which, every other song also could’ve made it to this list. Not many of you would be aware of this band but this song will leave you mesmerized when you will hear it once. It’s very soothing. Another less popular but greatly talented music band is American Authors. And this song of them is a nice, catchy and inspiring single. When it comes to an album’s popularity, then no one comes close to Ariana Grande, like the way she’s been in 2018. This particular song from her best album to date, this year, became an instant hit upon its release and is still the best choice of every music fan. Yet another inspiring and motivating number from the Spider-Man: Into the Spider-Verse movie’s album. The music of it makes you feel something in your veins, just like a superhero, who’s fearless. If you want to dance endlessly then this is the song for you. Each artist featured in this single is outstanding in her or her part, which makes it one of the best dance numbers of 2018. Another fantastic, and hard-to-miss number from Ariana’s Sweetener album. This song too became hugely popular among all the fans of Ariana and also the general music lovers too. Yet another brilliant song from the superhero animated feature’s album. The well-kept pace and vocals make up for an interesting and also a motivating number.